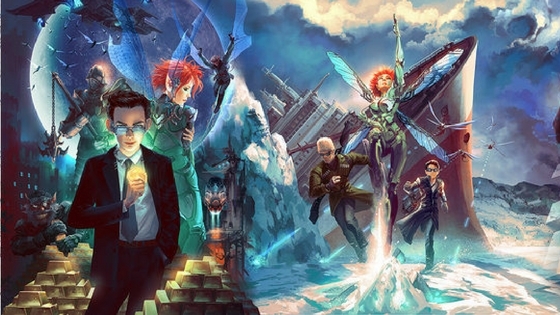 Artemis Fowl isn’t your typical boy genius. At 12 he’s a multimillionaire, a decorated scholar, heir to the Fowl criminal empire, and soon-to-be kidnapper of a fairy. That’s how Eoin Colfer’s Artemis Fowl begins, with young master Artemis planning the most daring kidnapping of the millennium. The first book was published in 2001, and will be the focus of this review. It had a great reception at the time of publishing, and eventually spawned seven sequels, as well a book of short stories. Movie rumors have surrounded this series almost since its inception, though nothing ever really seems to come of it. The latest word was that Kenneth Branagh had been brought on to direct, but that was in September of 2015 and no news has been heard since then. However, the book still deserves to be read. In the story, fairies aren’t some hyper-active 12 year-old’s fantasy, either. They are an entire race that lives underground, technologically advanced and hidden from the “Mud-Men” – us. Artemis is, by his own admission the perfect boy for the job: young enough to believe in fairies, and smart enough to find them – and find them he does. The one he finds, however, isn’t quite tinkerbell. Holly Short is technically a leprechaun, though that’s just a job. She is the only female member of the LEPrecon – the fairy city of Haven’s elite police force. And, while living up to her name, (coming in at just under 3 feet) she is not someone to be trifled with. She’s just one example of this story’s unique and colorful characters. There’s Butler, the 7-foot manservant and bodyguard to the boy genius. Besides being the most terrifying man to meet in an dark alleyway, he also has one of the most emotional connections to Artemis, having been assigned to protect him since birth. Commander Root can seem like your typical, stogie-chewing, short-tempered military man, but his heart and wit make him endearing. Foaly, Holly’s best friend is a good-natured, clever, egomaniacal, genius centaur and LEPrecon’s answer to MI6’s Q. These characters make this book great, and it’s hard not to go on too long about them. The depth, humor, and individuality of everybody Colfer brings to life in this story makes it compelling. The plot is more complex than anything you’d expect from a “young-adult” novel, and would even keep adults guessing. The first book in the series is especially unique because it turns the antagonist-protagonist dynamic on his head. Artemis is, almost objectively, the “bad guy.” He’s kidnapping someone for monetary gain, yet, he is also, without a doubt, the protagonist. He is the one proactively acting throughout the novel, and he does it with such intelligence, drive, and style that it’s hard not to root for him. Holly, as well, is so endearingly strong that you can’t help but like and understand both sides of this conflict. It’s hard to know who to root for in this story, or how it’s all going to play out, and that’s the sign of a good story. The main reason this story feels well-designed is that everybody has an important part to play, and those parts let these characters shine in them. Artemis’ cunning, guile, and intellect is on full display throughout the entire book. Holly, on the other hand, is anything but the quiet captive, and this story perfectly displays her resolve, skills, and heart. Root, Foaly, Butler, Juliet (Butler’s frightening younger sister,) and Mulch (a truculent dwarf with bowel control you wouldn’t believe,) all play important parts in this story, and that’s a credit to it. None of the characters feel out of place or obligatory. They are each unique, fully fleshed out individuals who act in the story, and the story gives them the setting needed to do so to wonderful effect. The writing is probably the weakest part of the book, though it doesn’t really hurt it, either. In later books (particularly the 6th and 7th) the writing definitely feels a bit lazy and forced. However in this first book, it’s good enough to present the plot and characters in all their color. It doesn’t detract from the story at all, and its usually entertaining and funny. The first three books in this series are all superb, and the writing stands up to the challenge of presenting these characters and plot, while balancing an audience of children, teenagers, and even some adults. Artemis Fowl is a fascinating book, and Artemis Fowl is a fascinating character. Full disclosure: this is one of my favorite books, and it’s honestly the one that got me into writing. That may discredit my opinion as biased, but I can’t help but love these books. In my opinion, if you’re looking for something intelligent, fun, and just a bit silly, I couldn’t recommend this book more.